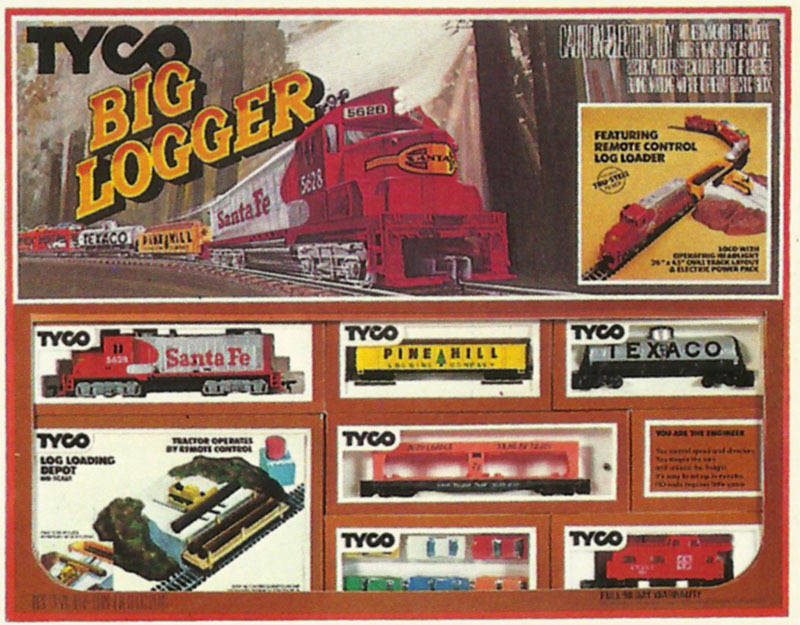 TYCO introduces its “Big Logger” train set in the company’s 1980 catalog. The original 1980 Big Logger (No. 7316) release came with a red-and-silver Santa Fe GP20 diesel locomotive, yellow Pine Hill Logging Company decorated gondola, Texaco silver tank car (No. 315A), Frisco Autoloader with six autos (No. 349), and red Santa Fe caboose (No. 327-22). The Tru-Steel track sections built a 36 x 45 inch oval layout. TYCO included its Log Loader (No. 914) accessory with this train set release. The set returns with no changes and the same stock number in TYCO’s 1981 product catalog. The 1980-1981 Big Logger’s diesel marks one of the first appearances for this very common late era Santa Fe red-and-silver decorated GP20. TYCO included as-delivered to Santa Fe in 1960 blue-and-yellow GP20s in train sets and as separate-sale releases since the early 1960s. The last appearance for the original livery Santa Fe GP20 (N0. 228-22) was in TYCO’s 1975-76 catalog. The 1976 TYCO catalog shows a revised Santa Fe GP20, also carrying stock number 228-22 as the first model did, with blue-and-yellow Warbonnet. Santa Fe introduced this freight-version Warbonnet scheme in 1972. That GP20 model is not thought to exist, beyond the mock up model created for use in the catalog. 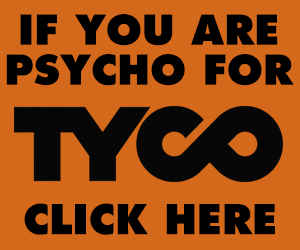 TYCO brings back a Santa Fe GP20 (No. 228-21) beginning with its 1978 catalog. That model would remain with the line to near TYCO’s departure from HO-scale trains in 1993. For collectors, some of these late era GP20s did come with any handrails. Early GP20s included metal and wire handrails that came bagged in the box with the model. By the late 1970s, TYCO was revising some diesel model offerings to include flexible black plastic handrails. You’ll find this red-and-silver Santa Fe GP20 sports TYCO’s black plastic single-piece handrails on some occasions and other models received no railings. 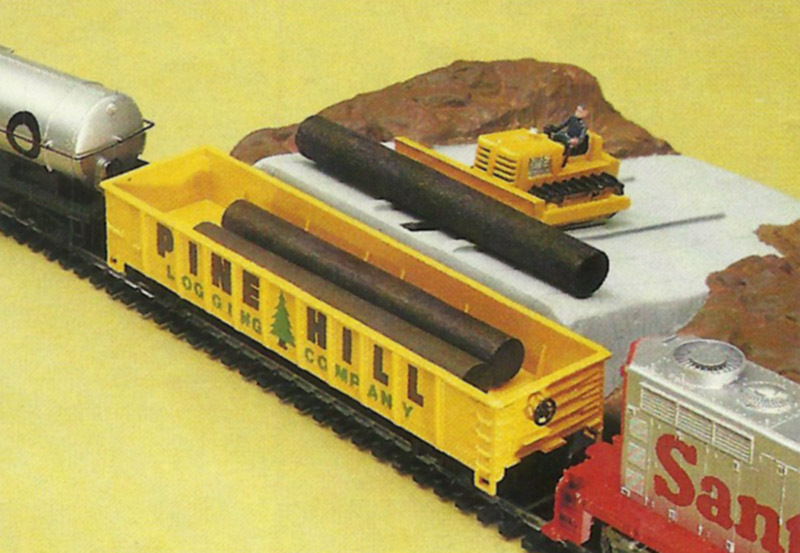 This set’s original Log Loader with Log Car (No. 914) accessory is noteworthy, as it is among TYCO’s later era action items that did not require connection to the power pack’s AC supply. Bought as a separate sale item, this release came with the molded plastic base with tractor, 40-foot gondola, three wood logs, and plunger button control. The button control connected to the base via a hollow tube. Applying pressure the red button, caused air to flow through the tub and move the tractor on its tracks. For its 1982 and 1983 appearances in TYCO’s catalogs, you’ll find the Big Logger (No. 7409) included a new Operating Log Dump Car (No. 952). This version was even more simple that the 1980 accessory. A newly tooled gondola-like car held the three wood logs and a post on one end of the car allowed the operator to lift the bay up and away from the car’s frame and manually dump the load into a supplied molded plastic tray. Both of these 1980s incarnations of TYCO’s log dump car are much more basic than the original Log Dump Car Set (No. 926) that operated with a push-button control and required electricity to work. For 1982’s Big Logger, TYCO was promoting its new TYCOSCENE layout boards. This set received a 4-1/2 x 3-1/2 foot TYCOSCENE layout board. The board was made of heavy stock and folded up for transport/storage. Printed on the board was landscape decoration, streets, and ballasted right-of-way. The same Tru-Steel 36 x 45 inch oval layout came with the revised Big Logger of 1982. The set’s train became a Rock Island red-and-yellow with white lettering Shark Nose (No. 222-10) with green Timberline Saw Mill log dump car, available only as part of TYCO’s Operating Log Dump Set (No. 952), a yellow 50-foot Railbox boxcar (No. 365-F), and red-and-yellow Rock Island streamline-cupola caboose (No. 327-10). The same Rock Island Shark Nose Big Logger returns in TYCO’s 1983 product catalog, but it absent beginning with the 1984 catalog.